Reston is a census-designated place in Fairfax County, Virginia within the Washington, DC metropolitan area. The main Reston post office is located at 11110 Sunset Hills Road, Reston, VA 20190. Photo: Reston Town Center (Main Street and Fountain Square), Reston, VA. Photographer: user:Payton Chung, 2012, [creativecommons.org/licenses/by/2.0/deed.en], via Wikimedia Commons, accessed September, 2016. Reston is located in the northwestern quadrant of Fairfax County, approximately 20 miles west of Washington DC, seven miles west of Tysons and six miles east of Washington Dulles International Airport. Reston was designed from its inception to have various land uses laid out within the community in a pattern that was different from most new American suburbs in the mid-20th century. Residential areas incorporated a variety of housing types so as to be attractive to households that were diverse in terms of age, family status (singles or couples without children, families with children, empty-nesters), and income. The Village Centers, designed to provide neighborhood shopping and other services, were located within residential areas rather than on the periphery so as to be easily accessible by walking or biking. Similarly, recreational uses were integrated into the residential neighborhoods. In addition, Reston was planned to have an employment center located in the middle of the community that could accommodate a variety of businesses. One of the first major employers was the United States Geological Survey (USGS), which located its offices on an 85 acre site in the Reston Center for Industry and Government (RCIG). The resulting land use pattern provided the opportunity for residents to be less dependent on a car to accomplish one's daily activities. The original land use designations consisted of residential, office, industrial, open space, convenience centers, village centers, convention/conference center and Town Center categories. Reston is currently served by a total of 10 public schools. These include 6 elementary schools: Coates, Dogwood, Lake Anne, McNair, Sunrise Valley and Terraset. The community is also served by two middle schools, Carson and Hughes, and two high schools, South Lakes and Westfield. The majority of Reston is comprised of residential neighborhoods. These neighborhoods contain a wide range of residential densities and architectural styles and include single family detached houses, townhouse clusters and multi-family communities, as well as parks and open space. 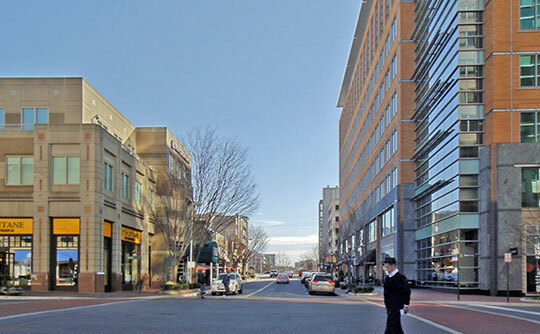 Reston was originally planned with Village Centers serving as the focal point of activity for the surrounding neighborhoods. The five existing Village Centers—Lake Anne, Tall Oaks, Hunters Woods, South Lakes and North Point—are planned to continue to serve this purpose in the future. They are planned for currently approved intensities and densities but are envisioned to have some redevelopment in the future to more fully achieve the goal of being vibrant neighborhood centers. The land on which Reston now stands first became a political entity in 1649 when King Charles II (exiled in France) deeded one-fifth of the present commonwealth of Virginia, a parcel of land known as the "Northern Neck Proprietary," to seven noblemen. Lord Culpeper, one of the original seven, later acquired title to the entire parcel which in 1710 went to his daughter Catherine, Lady Fairfax. The land remained in the Fairfax family for generations. In 1843 Thomas Fairfax, the Ninth Baron Cameron, deeded over 8,000 acres, including what is now Reston, to his son Reginald, who, in turn, sold the land to Benjamin Thornton in 1852 for $5.00 an acre. Following the Civil War, the land became a favored area for speculation. In order to satisfy back taxes, the land was put up for auction in 1886 and sold to Dr. Cart Adolph Max Wiehle and William Dunn for $20,000. New Town Predecessor in 1881, Dr. Wiehle, a successful German-born physician from Philadelphia, retired from general practice at the age of 35 and brought his wife and children to Washington. The Washington and Old Dominion Railroad made it possible for fashionable Washington families to own summer homes in the nearby Fairfax County, Virginia area, and in 1886 Dr. Wiehle formed a partnership with William M. Dunn to buy at auction 6,449 acres of rolling, timbered land in Fairfax along the railroad in the area known as Thornton Station. The cost was less than $4 an acre. The land was later divided, with Dr. Wiehle taking the 3,228 acres north of the railroad tracks, where in 1888 he built a Victorian-style frame house with an elaborate white gazebo near the station. The house is no longer in existence, but the gazebo still stands beside Reston Avenue. About the same time he bought an additional 300 acres, including the land now the property of the Fairfax Hunt, for $10 an acre. A man of prodigious energy and imagination, Wiehle must have found retirement at 35 unbearably dull, for he soon turned his attention to an ambitious project. In his virgin forests of oak and hickory he envisioned a new town, complete with a hotel, industry, parks and a community center. To lay out the town, Dr. Wiehle brought a planner from Germany, who used a modified grid pattern, which evolved from medieval European cities built inside walled fortresses for protection. The grid pattern was believed to bring the most economical use of land, and had been used for centuries, even where land was unlimited. Although only a few of the streets were ever laid out, many of Wiehle's plans were carried to completion. In 1887, he succeeded in establishing a post office named Wiehle (rhymes with Greeley), which it was to remain until officially changed to Sunset Hills in 1923. A two-story brick Town Hall with an 80-pound bell in its steeple was built at the corner of Edmond and Lakeside Avenues. Church services were held on the second floor until the Wiehle Methodist Episcopal Church on New York Avenue was completed in 1907. The church was in regular use until 1939, but the pulpit and pews have long since disappeared and the Chapel, as it is now called, houses scenery for the Reston Players. Of the planned 800 residences, only six or seven are known to have been erected. All the homes were similar in design and construction—two stories and finished in white clapboard. The house Dr. Wiehle commissioned, as a replacement for his summer home, was an imposing brick mansion of 25 rooms. Situated on a knoll behind the gazebo, it was completed in 1902. However, Dr. Wiehle died of pneumonia in 1901 and never occupied it. Within a few years after his death the town went into a slumber for 60 years. Transportation was probably not a major problem. The Washington and Old Dominion Railroad, successor to several earlier lines, made the 20-odd mile trip from Washington to Wiehle in less than an hour. During the rainy season, when unpaved Route 606 became impassable, the train was used for the short trip to Herndon for supplies. Furthermore, Wiehle's overall plan did call for industry, as necessary then as today if a town is to be self-sufficient. A strip of land along the old Lakeside Avenue, strategically close to the railroad tracks, was set aside for industrial use, but the limited extent of the industry may have discouraged prospective residents. The first industry in the area included a mill built for the Maryland and Virginia Serpentine and Talc Company of Baltimore. A brick kiln and sawmill were established to supply materials for the construction of the town, and an ice house was built on the shore of one of three lakes which were hand-dug on the edge of town near the intersection of the railroad and Louis Avenue. Only the largest of the lakes remains today—the others were filled in during the widening and paving of Route 602. The plan itself, though shortsighted by contemporary standards, probably was not responsible for the town's arrested development. Irving Wasserman, a Chief Planner for Gulf Reston, said, "For its time the plan was rather advanced. However, its street design clearly shows its variance with modern street planning, which is geared to contemporary traffic needs and relates to the contours of the land." The streets themselves were 60 feet wide, and the main thoroughfare 70 feet. The geometric arrangement of the avenues resulted in many triangular lots which would have been difficult to use. Several of these oddly shaped parcels were designated as parks, pre-dating by more than half a century the "vest-pocket" parks now being introduced in New York City. Economic conditions may have been a major factor in Wiehle's failure. The country experienced a severe panic and depression just before the turn of the century, caused in part by the silver crisis. The silver dollar fell in value to 49 cents after western mines began to produce silver in unprecedented quantities in the late 1890s. Land values also fluctuated wildly, with some areas in the United States doubling in value between 1881 and 1887, and by 1892, the date of Wiehle's completed plat, boom towns were turning to ghost towns as the inevitable deflation set in. Another factor in the plummeting land prices was the mechanization of farm production, which increased the yield per acre so that for the first time in history, production exceeded demand. The most likely reason for the town's early demise was the untimely death of its founder at the age of 50. His sons did not share his enthusiasm for the project, so the plan gathered dust on a shell and future expansion was abandoned. In 1908, Dr. Wiehle's heirs sold 3,500 acres for $80,000, and the acreage was primarily used for farming for the next 15 years. After changing hands several times, what was left of Wiehle was purchased by the A. Smith Bowman family in 1923, and a distillery—Virginia Gentleman—was established in the town's old industrial buildings. The ice house became the office of the Internal Revenue agents assigned to the distillery, and the church-like steeple was removed from the Town Hall so that the structure could be decently used for aging the barrels of whiskey. In 1947, the Bowmans purchased the former Dunn tract south of the railroad, bringing their total holdings to well over 7,000 acres. The property changed hands twice more before all but the portion occupied by the distillery and the former Wiehle mansion, now the home of A. Smith Bowman Jr., was acquired by Robert E. Simon, Jr., a man with a new dream he called Reston. Simon Enterprises, headed by Robert E. Simon, Jr., purchased 6,750 acres of the historical parcel of Virginia countryside in March 1961 from Lefcourt Realty Corporation. The price of the purchase was $13,150,000 or $2,000 an acre, a long way from the $5.00 an acre paid by Benjamin Thornton 100 years earlier. That the widest choice of opportunities be made available for the full use of leisure time. This means that the New Town should provide a wide range of recreational and cultural facilities as well as an environment for privacy. That it be possible for anyone to remain in a single neighborhood throughout his life, uprooting being neither inevitable nor always desirable. By providing the fullest range of housing styles and prices—from high rise efficiencies to six-bedroom townhouses and detached houses—housing needs can be met at a variety of income levels, and at different stages of family life. This kind of mixture permits residents to remain rooted in the community—if they so choose—	as their particular housing needs change. As a by-product, this also results in the heterogeneity that spells a lively and varied community. That the importance and dignity of each individual be the focal point for all planning, and take precedence over large scale concepts. That people may be able to live and work in the same community. That commercial, cultural and recreational facilities be made available to the residents from the outset of the development—not years later. That beauty—structural and natural—is a necessity of the good life and should be fostered. That Reston be a financial success. Simon wanted his country-city to be more than a place to live; he wanted Reston to be a way to live. He wanted to offer not only a new kind of housing scheme and a new relation of home to recreation, but another dimension-thoughtful planning for community life. Frustrated by the disappointments of family life in suburbia, incensed by the enormous waste of time commuting from home to city, disillusioned by the asphalt wilderness of the regional shopping center, Bob Simon looked to Reston as a creative solution to America's increasing urban crisis. Reston was soon to become the first major effort in the United States to build a full-scale self-contained city on the perimeter of a larger metropolitan area. Simon was familiar with the ten satellite cities, of 30,000 residents each, which Leonardo da Vinci had proposed for Milan in 1484 as a solution to the overcrowding which brought on the Black Plague that same year. Bob Simon was no stranger to the works of Ebenezer Howard (1850-1928) whose book Garden Cities of Tomorrow (1902) inspired England's first city-in-the-country, Letchworth. Simon's father was involved in financing America's first garden city in 1928, Radburn, New Jersey. Assisting the planners of Radburn, Clarence Stein and Henry Wright, was a young architect, Julian Whittlesey. It was to the firm of Whittlesey and Conklin in that Simon eventually turned for the creation of the Reston Master Plan. The firm of Whittlesey and Conklin (now Conklin and Rossant) deserves the major credit for the distinguished plan which today guides the development of Reston. Convinced that his master plan should be shaped by innovative land use, Simon envisioned Reston as a well-balanced community, not merely another subdivision. He wanted Reston to be a unique, private real estate venture which would integrate residences, industry, commerce, schools, churches, cultural institutions, social and recreational facilities in an essentially independent community structure which would be economically viable and socially desirable. Faced with conventional zoning ordinances in Fairfax County which segregated residential, industrial and commercial use, Simon had to formulate his own code in order to make his dream become reality. "Our present zoning ordinances are largely responsible for the diffusion of our communities into separate, unrelated hunks without focus, identity, or community life," Simon said. "They have helped produce chaos on our highways, monotony in our subdivisions, ugliness in our shopping centers. They are to blame for the whole neon-lighted wasteland that exists because of the subdivision's separation from commercial and recreational facilities." Simon dreamed of a cohesive community made possible by mixed density zoning. "Mixed land use reduces the distance between homes and offices, stores, community facilities, and recreation. It provides day and night use of the same areas and facilities, which is more efficient economically, more interesting aesthetically, and safer. Mixed land use gives the developer greater flexibility. He can construct garden apartments, high-rise buildings, and townhouses in a way appropriate to the topography of the land. And mixed land use saves space, which makes additional facilities possible." Assisted by economic, social, legal and political consultants, and armed with a creative master plan based on sinews of high density linking seven village centers and a town center, Bob Simon presented his bold innovation to Fairfax County. In June 1962, the Board of Supervisors of Fairfax County adopted into law Residential Planned Community (RPC) zoning. Based on population density distribution, the RPC code allows the land to be divided into density areas: high (60 people per acre), medium (14 per acre), and low (3.8 per acre), and permits apartments above stores, high-rise with townhouses, and the spread of commercial, recreation and community facilities throughout. Under this zoning code, the developer must submit a master plan to the county and maintain an overall maximum density of thirteen people per gross residential acre. "We started with a program rather than a plan," Simon said. "We asked what people could he offered when they moved here, rather than what we were going to do with the land. It was like Christmas. Whatever we could dream up, we would write down. And, in the end, we actually used many of the ideas we wrote down." The physical plan that emerged came from the concept that people came first. The usual concentric, bull's eye plan, with densest areas in the center and a green belt around the outside was avoided. Successes and mistakes of new town building in Europe and Britain were carefully studied. Open space in Reston, it was decided, would be used for recreation rather than protection, as in other new towns. Simon wanted to make these open space areas as accessible as possible to all residents. This desire sparked the Whittlesey and Conklin plan for high density sinews that wind through the property from north to south. This plan brought all residents within walking distance of these recreation areas. The Reston master plan called for seven village centers which would provide convenience shops and community facilities for 10 to 12,000 and serve as the focal point of each neighborhood. 42% of the gross acreage was left to the public factor, which included open space, roads, parks, golf courses, walkways, schools and churches. A town center was established which, when built, would service not only Reston's expected 75,000+ population, but an additional 50,000 people as well. 1000 acres, in the heart of the property, were set aside for an industrial center. By the spring of 1963, working drawings were in order and detailed plans had been approved by the County for construction of Lake Anne Village Center, Reston's pilot project. A substantial loan from the Gulf Oil Corporation early in 1963 enabled Simon to put into operation the elaborate machine which he had started two years before. The first project was the building of 30 acre Lake Anne. Carved out of a natural water-shed area, 94,000 cubic yards of earth were moved to create a 45 foot high by 500 foot earth dam. Completed in August 1963, at a cost of close to a quarter of a million dollars, the Lake Anne dam impounded the waters of Colvin Run and the lake began to fill. By the time the dam was completed, work had already begun on Reston's first 18-hole golf course. Designed by golf course architect Edmund B. Ault, the Reston North Golf Course was over 7,000 championship yards. An entire underground irrigation system was put in, drawing water from newly-formed Lake Anne. Throughout the spring of 1963, construction began on the shops, apartments and townhouses of Lake Anne Village Center, designed by master planners Conklin and Rossant. Simultaneous construction began on the first two townhouse clusters: Waterview Cluster, 90 townhouses designed by Washington architect Cloethiel W. Smith, and Hickory Cluster, 90 townhouses designed by Charles M. Goodman. This initial project included 227 townhouses, 113 rental apartments, including 15-story Heron House, and approximately 50,000 square feet of commercial space. During this same period of time, three different projects were set in motion, in May of 1963, Reston's first residential sales office, known simply as the "Roundhouse," started pushing up its walls on the hillside overlooking Route 606. It was located on the road which was at that time the sole entrance to the growing village center from the highway. A mile away, siting and grading started on the Group Facilities Complex in the heart of the 1,300 acres set aside for government and industry. Located along the Washington & 15 Old Dominion right-of-way, across the valley from the Bowman Distillery, the Group Facilities Complex was immediately adjacent to the newly graded fairways of the first golf course. During the following spring, construction began on the first 33,000 square foot shell building of what was soon to emerge as Isaac Newton Square. Meanwhile, down at the southern tip of Reston's eleven square mile boundary, siting and initial road grading began off Route 602 (now Reston Avenue) in Hunters Woods Village—Simon was persuaded by the County planners to concentrate his low density areas around the periphery of the 7,400 acres. He felt it important to begin selling lots for detached, single family homes in Hunters Woods Village in case the cluster concept of Lake Anne Village was not acceptable to the metropolitan Washington market. As work commenced in Hunters Woods Village, Simon and his legal counselors worked on the Deeds of Dedication and By-Laws for Reston's First and Second Homeowners Associations: the First to serve the area north of the Dulles Access Road, the Second to serve the area south. The principal role of the associations was to care for the land and facilities designated for community use and common ownership: i.e. open spaces, swimming pools, tennis courts, Lake Anne. A secondary role of the associations was to enforce the covenants set forth in the Deed of Dedication which is part of the title to each parcel of Reston land. The covenants dealt with the external appearance of property and empowered an Architectural Review Board to approve plans for all non-developer construction. The Reston North Golf Course opened for play in May 1964, and during its first season averaged 1,000 rounds per week. Shortly thereafter, construction began on the 40-stall Reston South Riding Center in Hunters Woods Village. At the same time, a number of single family homes began to emerge out of the woods opposite the Riding Center. Two days before Thanksgiving, 1964, the Reston Industrial Division welcomed its first tenant—the Air Survey Corporation, an aerial photographic and photogrammetric engineering firm with 30 employees—into the Group Facilities Complex. Two weeks later, on December 9th, the Residential Sales Division greeted Reston's first citizens, a couple who purchased a Waterview Cluster townhouse on the shores of Lake Anne. Industry had preceded the people. Five days later, on December 14th, Reston's second industrial tenant, HRB-Singer, Inc., a division of the Singer Company, moved into their laboratory facility on a five-acre wooded site in the Industrial Center. By February 1965, the entire commercial space available in the Lake Anne Village Center had been leased. The leases included a pharmacy, Fairfax County branch library, a decorator studio, hairstylist, hardware store and garden shop, dry cleaners, barber shop, restaurant, art supply store, card and gift shop, supermarket, and children's store. In addition, space in the first office building was quickly rented out to a life insurance company, a bank, a lawyer and two dentists. By the time Lake Anne Village Center was officially opened on December 4th, 1965, two community swimming pools, four tennis courts, a volleyball court, numerous playgrounds, a pedestrian underpass and several miles of pedestrian walkways, the first 18-hole golf course, a riding center, a fifteen story high rise, 227 townhouses, 113 apartments and approximately 100 single family detached homes, not to mention the village center itself, had all been completed. In addition, seven industries had signed up for occupancy in the Industrial Center and four were actually in operation, employing over 250 people. Residential population was approximately 500. Throughout 1964 and 1965, the John Hancock Mutual Life Insurance Company had been watching the development of Reston with keen interest. At the end of 1965, it was announced that Hancock would invest a considerable sum of money in permanent financing for the orderly long-term development of Reston. Reston was officially dedicated on May 21, 1966. Guest speakers at the Dedication Day Program included Stewart L. Udall, Secretary, Department of the Interior, and Robert C. Weaver, Secretary, Department of Housing and Urban Development. The Dedication Address was given by Mills E. Godwin, Jr., Governor of The Commonwealth of Virginia. At this landmark program, Robert E. Simon, Jr., was awarded HUD's first Urban Pioneer Award. In a telegram from the President of the United States, Lyndon B. Johnson sent greetings: "In this age of ever-mounting urban growth, the birth of a new town such as Reston is a living influence which invigorates our concepts of urban planning ... I extend greetings to all of you as you dedicate the City of Reston." During the Dedication ceremonies, Secretary Udall revealed the Federal Government's decision to build the new $50,000,000 headquarters of the U. S. Geological Survey on an 85 acre site in Reston's Industrial Center. Skidmore, Owings & Merrill would be the architects for the 1,000,000 square feet of space. By the end of 1966, four more major industries had signed on to join the Reston community. Population had tripled in a year's time, townhouse sales were moving well for the first time, the apartments were 100% occupied, and close to 200 single family homes were either occupied, built or under construction. But development and sales could not move fast enough to cover the tremendous burden of developmental costs. By the fall, the residential population was nearing an unimpressive 2,500, and only about 370 townhouses, 400 apartments and 325 home sites had been sold or rented, far short of projections. Bob Simon had exhausted his financial resources. It was at this point that the Gulf Oil Corporation stepped in. "It would be a mistake to believe that Reston's current problems raise questions about the viability of the New Town movement, or about Reston's design. The project difficulties stem from neither of these sources. They reflect the fact that in the U. S. we have not yet faced up to the special kind of financing needed by New Towns. Contrary to other kinds of construction projects, a New Town by its nature must provide for a long lead-time between investment and returns—a time when costly community facilities and amenities, plus payments, taxes and land carrying cost in general will deplete early capital and there will be insufficient income to replace it." Gulf Oil Corporation had been studying Reston's profit potential from the very earliest days. It was their initial investment in the spring of 1963 that enabled Bob Simon to go from blueprint to bulldozer. Gulf saw promise in the professionally planned community as an investment as well as a means of demonstrating the company's interest in the orderly development of New Towns in the U. S. with private funds and experienced management. As an international company operating around the world, Gulf had been observing over the past several decades the sociological impact of the New Towns being built in Sweden, Finland, Scotland and England. Gulf Oil was no newcomer to the world of town planning: a wealth of experience in designing and building complete towns all over the world provided financial and managerial insight. Based on exhaustive computer studies regarding Reston's profit potential, land use restrictions, financial feasibility studies, and managerial availability, Gulf decided to accelerate and expand the development of Reston consistent with the long-term aspects of the project. Planning Division Staff, Fairfax County Department of Planning and Zoning, Working Draft Fairfax County Comprehensive Plan Text, UP5 Community Planning Sector, 2014, www.fairfaxcounty.gov, accessed September, 2016. Gulf Reston, Inc., A Brief History of Reston, Virginia, 1970, used with permission, www.fairfaxcounty.gov, accessed September, 2016.